The first night with any new lover is always poignant and memorable (or drunk and embarrassing, but let’s try for romantic and pretend I mean “first night with nice potential longish term lover” not “first night with completely wasted random that we’re going to be a hoping won’t be around in the morning lover”). It’s the moment at which anticipation turns to actualisation. There is excitement and purpose, mingling with untapped potential. Your nerves and their nerves make even the most ho-hum of moments feel electric. The future looks bright. It’s also the moment at which you realise most keenly your new lover is not your old lover. Awkwardly, as you are losing your self in delightful impatience, you’re also secretly remembering that the person who used to know the way you liked that thing you liked is not here right now. This new bright future person is doing things not quite the way you liked, because, well, you don’t know them well enough to tell them how you like it. Seems a bit bossy the first time. Obviously, everyone marks that difference differently – maybe you’re 100% glad to be rid of that old love and it’s just a passing observation – maybe you’re trying to get over a bad break up by getting under a good rebound shag, maybe you’re still pining away and each differentiated kiss is just another articulation of your loss. Who knows? Either way, you’re noticing that your new love is not your old love. Even if it’s only for a moment. So it is with bikes. And cities. Like, yesterday, I was all about the Brompton. I couldn’t wait to get it off the carousel (weird, Qantas self check at Brisbane said take the bike to oversized luggage, the oversized luggage people looked at it and said it wasn’t oversized and I had to self check it, then I said it was a bike and the man said I had to oversize luggage it, then at Melbourne I waited at oversize delivery for ages and the bike was just doing sad little laps without me at regular luggage) and I couldn’t wait to take it for a ride. Even the five or ten minutes I rode it felt excited. I was literally whooping with giggles. It’s nice to ride upright for a change. I was cruising in comfort and convenience. I parked it just for the joy of parking it. But somehow, I kept remembering an old love. 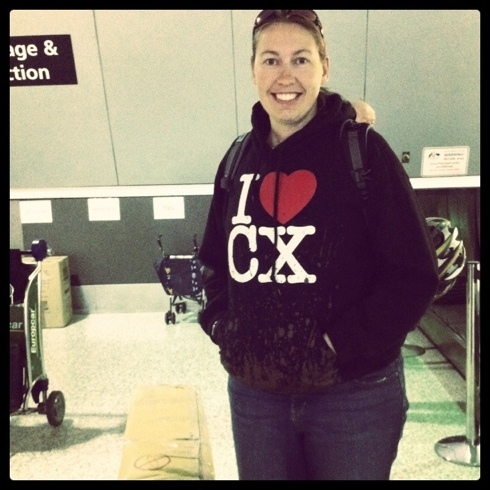 Perhaps it was Gemma, who I ran into at the oversized luggage area, wearing a CX hoodie. I was immediately drawn to the pre-mud-splattered design and just had to ask about it. 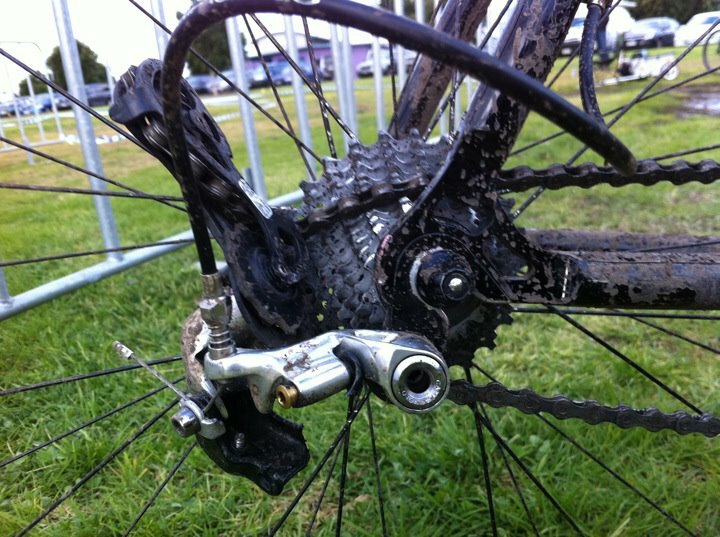 Turns out she was heading to the CX race that afternoon, to get real muddy – and presumably freezing, because the weather was freaking awful yesterday morning (then it was nice, very Melbourne). As enamoured as I was being with the Brompton, I definitely felt the tinge of regret at cheating on Cyclocross with a folding bike. All of which segued into this article sent to me by Nik regarding the timeless dilemma of how to be a lady and a cycling sportstar. Can you wear mascara and still smash it on the trails? Molly Hurford, cyclist, writer and thought provoker thinks you can. I’m inclined to agree. 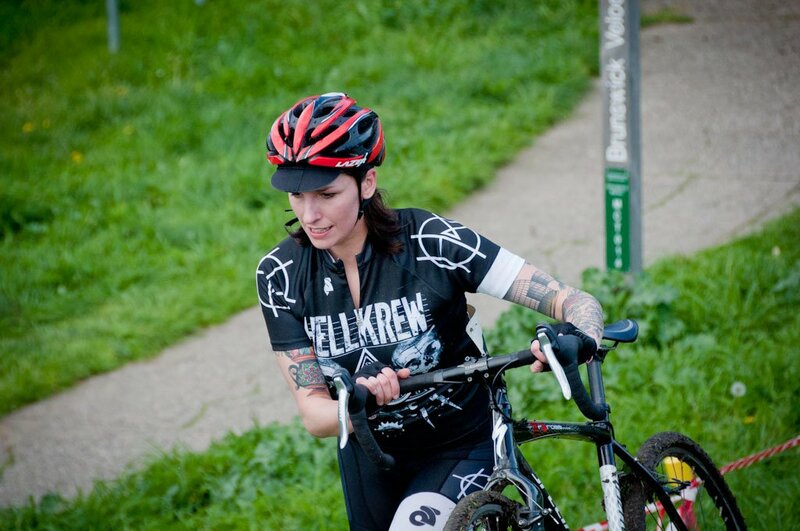 I don’t know if it’s Mik’s photography, but he always makes Jessie Jean look freaking amazing doing cyclocross to me. Case in point his pic of her at DDCX 3. Naturally Jess has some serious natural talent behind looking good and is also a great, fun, enthused, beer swilling racer. Interestingly both Molly and Jess favour the Lazer. Is there a theme emerging? Hmmm…. But it’s okay – with my bikes and my cities, I’m just noticing the different. Back in my old town (read old lover’s bed, um, kind of actually my old old bed, weird! ), I am feeling anew all of the wonderful things about it. Melbourne is an amazing city, filled with friends and memories and memories and friends. Sometimes it’s okay to have loved and lost, it’s just really nice to have loved at all. Speaking of. If you want to see me not dressed like this, maybe you’d consider coming to see my poetry show, A Mills & Boon Swoon, at Long Play in Fitrzroy. I’d like that very much. Pre-book perhaps, as there are only 24 or so seats per show, so it’s pretty tiny. At $10 a ticket, it’s a cheap date. Nice writing! we miss you at CX, there’s a nice little community of awesome chicks now. I am sorry to have missed it! But I was smiling to see Gemma getting ready for it… I’m so glad that there’s more girls riding, makes me feel like I’ll have to get my gig in gear for next year! 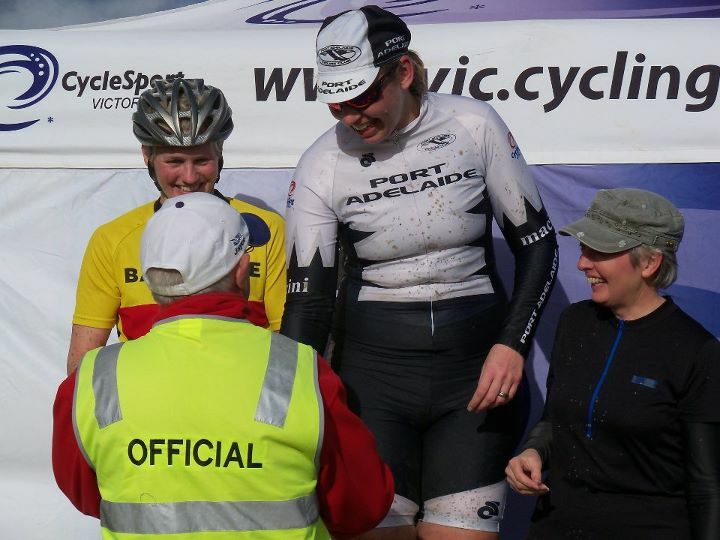 You don’t have to wait till next year to race CX, bring your Brompton to rAdelaide this Saturday! You want me to contact Lazer about supporting a women’s CX development program. Sure. Now, as for the Brompton, although I am prepared to make a very mini wheelie (like 3 inches maybe), I do not believe the clearance would be in my favour for Adelaide. That said, I have done sillier things than fly interstate for a sporting event.